to meet industry performance requirements. A fully supported one-piece shaft and heavy-duty metal bearings ensure perfect alignment of seat and disc leading to long life and trouble-free performance. including PTFE seat, reinforced PTFE seat, flexible metal seat and the dual seal Fyre-Block® seat. service capabilities with features which have been time-tested for over 30 years. BHP butterfly valves are available in both lugged and wafer bodies in sizes 2–60" (50–1500mm). Body materials include Carbon Steel, 316 stainless steel, and 317 stainless steel (Class 150 lugged only). In addition, DeZURIK regularly supplies valves in materials such as Hastelloy C, Monel, Inconel, Duplex Stainless Steel, and Titanium. Materials chosen for the construction of the BHP butterfly valve are certified per ANSI B16.34. DeZURIK offers valve face-to-face dimensions in compliance with API 609, MSS SP68 and ANSI B16.10. Flange drilling conformance to ANSI 150, PN10/16 (ISO, DIN, BS, JIS) and ANSI 300, PN25/40 (ISO, DIN, BS, JIS). Fyre-Block®, PTFE, and reinforced PTFE seats provide full bi-directional seating. BHP lugged body style allows installation in dead-end service to the full pressure rating of the valve. Standard construction provides effective sealing with ANSI B16.20 gaskets (formerly API 601). The standard seat retainer is drilled to meet the requirements of API 609 standard. As an option, an undrilled seat retainer is available to provide full seal area contact with ANSI B16.20 gaskets. The seat retaining ring is nested in the valve body, providing support and protection for the seat and a captured blow-out resistant body-to-retainer seal. Performance tested in up to 5% consistency pulp stock isolation. Tested for over 1 million cycles in oxygen manufacturing service with zero leakage. Fire tested to API 607 3rd and 4th edition. Tested in hot hydrogen peroxide service for over 75,000 cycles with zero leakage. Accuracy to repeat signal changes as small as 0.5% of total signal. The High Performance Butterfly Valve with Fyre-Block® seat qualify to API 607 4th edition fire tests. Fyre-Block® seats offer a seat and seal design that provides positive sealing, even when the resilient material has been burned away. It is also designed to pass BS5146, FM 6033, and API 6FA. alignment, ensuring a proper seal. To enable manufacturers to meet clean air regulations, DeZURIK offers the best available technology. The BHP butterfly valve features options for fugitive emissions control including live loaded and dual packing sets. Dual packing options feature a primary and secondary packing set, lantern ring and emissions sniffing port. When required, the packing gland can be live loaded with spring washers to maintain compression, even through extreme thermal cycling. Live loaded and dual packing options have been cycle tested per EPA method 21 and have been proven to provide long service life with emissions control well below Clean Air Act regulations of 500 parts per million. Live loaded packing and dual packing sets are available in the BHP butterfly valve with a bolt-on packing chamber. DeZURIK uses a reliable method for disc-to-shaft pinning. The 2–12" (50–300mm) valves utilize a wedge-shaped, tangential pin with a locking taper to ensure a tight connection between disc and shaft. On 14" (360mm) and larger, two pins mounted in compression offer a non-shear method of locking. Both connections place the pin, shaft and disc in compression load providing a much stronger connection. This solid pinning ensures no lost motion between shaft and disc, an essential feature for a control valve. Set screws and pins are securely locked in place, but can be easily removed if repairs are necessary. For high-temperature applications to 700°F (370°C) as standard and to over 1000°F (538°C), a metal seat of 316 stainless steel provides FCI 70-2/ANSI B16.104 Class IV or V shutoff even at elevated temperatures. For increased economy in applications to 450°F (232°C), the metal seat can be specified with lower temperature bearings, packing and paint. The metal seat is electroless nickel coated and heat treated for superior service without the use of costly, exotic seating materials. Pressure assisted soft seats, in either PTFE and reinforced PTFE, offer bi-directional bubble tight shutoff. Soft seat options include either a titanium or Inconel back-up ring which utilizes hoop stress to provide memory for the seat. For services requiring a fire-tested valve, the Fyre-Block® seat combines a primary PTFE soft seat with a secondary 316 stainless steel metal seat. This dual, bi-directional seat design provides positive sealing even when the resilient seat has been destroyed by fire. The Fyre-Block® seat design meets the API 607 standard, 3rd and 4th Edition. The valve shaft is fully supported with bearings for high cycle capability. Two bearing options are available: PTFE and solid metal (Nickel Stainless). The bearings also provide a large area of radial support, greatly reducing any possibility of shaft fatigue and breakage. A thrust surface on the bearing maintains the disc position in the center of the seat. The bearing has a low coefficient of friction, minimizing operating torque. 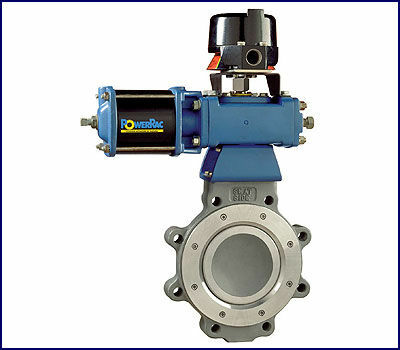 BHP butterfly valves meet the requirements of NACE MR-01-75. NACE trim is standard when reinforced PTFE, PTFE/Titanium, PTFE/Inconel or Fyre-Block® seats are selected. Metal seated valves meet NACE requirements as standard when equipped with PTFE bearings. When specified as an option, components of metal seated valves will also meet NACE MR-01-75 requirements. DeZURIK’s Class IV and Class V metal seated valves have a gasket between the valve body, seat and seat retainer which provides an independent static seal. Without this seal, corrosion or pitting on the body or seat retainer could cause leakage around the seat. This is of particular concern in valves of carbon steel construction, or in applications where stainless steel is prone to pitting due to corrosive precipitation. DeZURIK BHP valves are easily repairable. In the unlikely event that a seat, disc or bearing needs to be replaced, the valve can be easily disassembled. Internal valve components can be easily replaced or repaired in minutes, not hours. There are no welds to remove or pins to drill out, and all fasteners are common sizes. All that is required is to remove the screws fastening the retainer to the body and the screw that locks the disc-to-shaft pin. Extended service life is an important attribute when considering a valve for a given application. DeZURIK realizes installation and replacement costs, combined with the costs of a process shutdown, are expensive. That’s why DeZURIK has always been dedicated to designing and manufacturing valves that last longer and perform better. High Performance Butterfly Valves are compatible with all DeZURIK standard actuators including levers, handwheels, chainwheels, PowerRac® cylinder, spring diaphragm, and Compak™ actuators. Also available is a full line of accessories integrated with the actuator system including positioners, solenoids, switches, and speed controls.